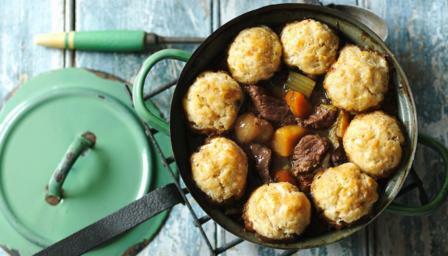 For the coldest wintry evenings, tuck into a rich beef stew with fluffy dumplings to warm you right down to your toes. Stir in the wine, stock and herbs, then add the Worcestershire sauce and balsamic vinegar, to taste. Season with salt and freshly ground black pepper. To serve, place a spoonful of mashed potato onto each of four serving plates and top with the stew and dumplings. Sprinkle with chopped parsley.